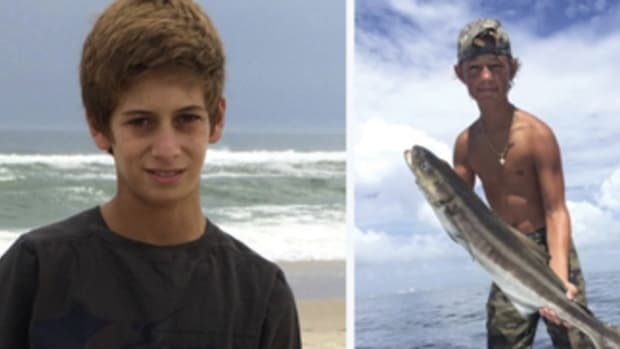 Nearly a year after three football players died on an offshore fishing trip in the Gulf of Mexico, another trio of anglers avoided the same fate - in the same area - because their 32-foot boat was equipped with an EPIRB and other survival equipment. "We were able to rescue these people quickly, in part, because they had the right safety equipment," says Lt. j.g. Daniel Cathell, co-pilot of the HH-60 Jayhawk helicopter that found the men 56 miles northwest of Clearwater, Fla. "This was a successful case largely because they were prepared." The football players who perished in February 2009 were 50-plus miles west of Clearwater, but there was no EPIRB on their 21-foot Everglades center console. National Football League players Marquis Cooper, 26, and Corey Smith, 29, along with former University of South Florida player William Bleakley, 25, died when Cooper&apos;s 2005 Everglades swamped and rolled over as the men tried to free its fouled anchor. Nick Schuyler, now 25, of Tampa, Fla., survived by staying on top of the overturned hull for 43 hours, clutching the lower unit of the boat&apos;s single Yamaha 2-stroke. He recounts the ordeal in a recently published book, "Not Without Hope" (see facing page). In the recent accident off Clearwater, the Coast Guard rescued all three fishermen - brothers Christopher and Matthew Whalen and Adam Triplett, all from Largo, Fla. As they slept, a wave swamped the 1985 diesel commercial fishing vessel, Rubicon, and killed battery power, according to petty officer Mariana O&apos;Leary, a Coast Guard spokeswoman. With the boat continuing to take on water, the men activated their EPIRB around midnight and were located less than two hours later. A rescue swimmer was lowered, and they were hauled up to the helicopter one by one in a basket. The boat was left behind. "It got a little hairy out there with their boat being so low [to the water]. ... But it couldn&apos;t have been any easier to find them," says Cathell. The wind was blowing 15 knots, with 20-knot gusts, and seas were running about 3 feet. Air temperature was 65 degrees. The EPIRB activation set the search-and-rescue mission in motion, but another locating tool actually pinpointed the fishing vessel, says Lt. Flavio Baltazar, Sector St. Petersburg (Fla.) command center chief. 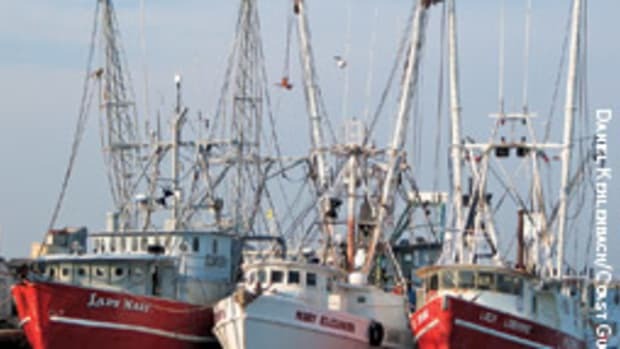 Rubicon was registered with NOAA&apos;s Vessel Monitoring System, a national program for tracking commercial fishing vessels in VMS regions or fisheries to ensure they are in compliance with regulations. VMS-registered vessels carry satellite transponders that transmit the position reports, and Baltazar says that&apos;s how the Coast Guard obtained the stricken vessel&apos;s coordinates. As a Coast Guard-documented commercial fishing vessel, she also was required to carry an EPIRB and a life raft, says Baltazar. Matthew Whalen had bought the boat about a month prior to the accident but had yet to reregister the EPIRB, according to Baltazar. When the EPIRB signal was received, the Coast Guard called the emergency phone numbers associated with the registration. However, that put rescue authorities in contact with the previous owner, who knew nothing about the boat&apos;s whereabouts. If it hadn&apos;t been for the VMS transponder on Rubicon, it would have taken longer for the Coast Guard to find the men. Baltazar urges boaters to register their EPIRBs and make sure the contact and other information is current (visit www.beaconregistration.noaa.gov). "This is extremely important when the vessel is sold or contact information is updated," says Baltazar. "The more current information the better." 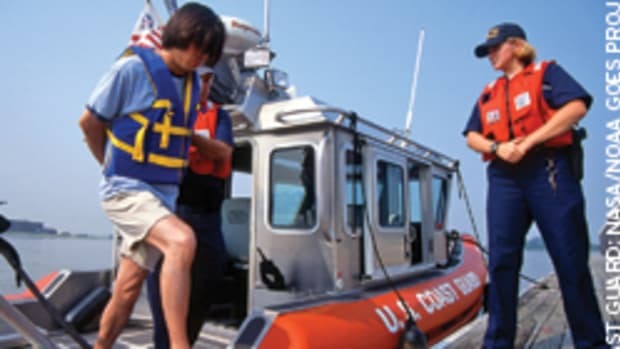 The Coast Guard&apos;s $1.6 million, three-day search for the football players covered 20,000 square miles, highlighting the importance of carrying the right safety equipment and the critical role an EPIRB plays in search-and-rescue. The incident prompted the Southern Kingfish Association to adopt a mandate that will require all participating anglers to carry ditch bags with EPIRBs and PLBs beginning in 2011, says association managing partner Jack Holmes. "I think it opened up our eyes," says Holmes. "The last thing I ever want to have to do is pick up the phone and call a fisherman&apos;s wife and say, &apos;Your husband is unaccounted for - have you seen him?&apos; We&apos;ve been talking about [mandating EPIRBs] for several years. The accident spurred us into action." Thousands of anglers participate in SKA tournaments each year, and about half of them already have EPIRBs, says Holmes. "The time has come," says Holmes of the tournament&apos;s pending carriage requirement. "The cost of an EPIRB has come down dramatically. This will make an awful lot of wives who don&apos;t fish with their husbands very happy." EPIRBs cost around $800 to $1,200, while PLBs range from $300 to $600. Rubicon was equipped with an ACR Satellite2 406 MHz, a Category I model without an integral GPS. A Category I EPIRB automatically releases from its bracket when submerged between 3 feet and 14 feet. Category II EPIRBs must be manually released. Both begin transmitting when they are out of their brackets and wet; they also can be manually activated in or out of the brackets. The accident occurred late in the evening Dec. 23. At 12:37 a.m. Dec. 24, the Coast Guard district command center in Miami notified the agency&apos;s air station in Clearwater that it had received an EPIRB signal, says O&apos;Leary, the spokeswoman. At 1 a.m., a rescue helicopter was launched and began searching the area. Thirty-five minutes later, rescuers spotted the sinking vessel with the help of a red flare the anglers ignited and the EPIRB&apos;s strobe, she says. 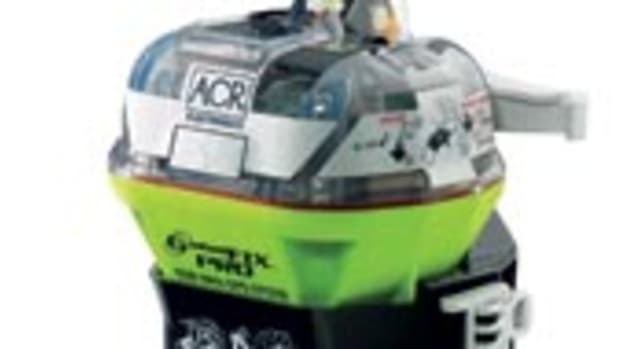 "Once we activated the EPIRB, we knew the Coast Guard would come," Triplett, a crewmember on the fishing boat, told ACR public relations specialist Leslie Sheffield. "We were sitting ducks basically. We got together and said a prayer on top of the boat. This year our Christmas present was from God. I don&apos;t think we&apos;ll ever have anything bigger than that. We are happy we all have our lives. I&apos;ll never go out without [an EPIRB]."